Ph.D., New York University (2008). Professor Cornell has taught at the University of New Mexico and the University of Massachusetts-Amherst. Her research focuses on transnational history in the Civil War era. 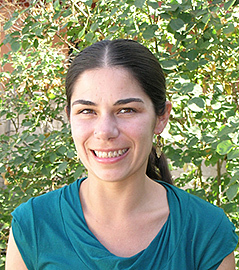 Her prize-winning article, "Citizens of Nowhere: Fugitive Slaves and African Americans in Mexico, 1833-1857" appeared in the Journal of American History (September 2013). The article was recognized with the Organization of American Historians' 2014 Binkley-Stephenson Award, the Nineteenth-Century Studies Association's 2014 Emerging Scholars Award, and an honorable mention for the Chaurduri Prize from the Coordinating Council of Women Historians. Cornell has a forthcoming publication in the Journal of the Civil War Era. Cornell is completing her first book manuscript, “Americans in the U.S. South and Mexico: A Transnational History of Race, Slavery, and Freedom, 1810-1925.” By illuminating black and white Southerners' visions of themselves as members of a transnational community, she shows that Southerners' conceptualizations of race and labor did not always fall neatly into the categories of “black” and “white,” nor into those of slavery and freedom. Rather, Southerners considered Mexico and Mexicans as providing potentially alternative configurations of race and labor, both in the present and in the future. Although scholars characterize the Mexicanization of the U.S. South as a recent phenomenon disrupting the black-white binary, this book, the first study of Mexicans in the nineteenth-century South, demonstrates this is not the case. Cornell’s work engages a wide variety of Southerners over a century as well as the reverse flow of Mexicans into the South, providing a sweeping view to demonstrate that moments of transnational engagement were not exceptional, but commonplace as Southerners confronted hemispheric upheaval and new possibilities in the age of emancipation. Cornell’s research has been supported with funding from the National Endowment for the Humanities, the Clements Center for Southwest Studies, the Society for Historians of American Foreign Relations, the Collaborative Research Group for the Study of the Global South at Tulane University, the American Historical Association, the Huntington Library, the University of North Carolina-Chapel Hill, the Labor and Working-Class Historical Association, and New York University.